The Skeleton is a table-top/board/card game in which the players build skeletons from a set of different bones and add-ons. The aim of the game is to defeat the opponent’s skeleton. Have you ever imagined how weird a human skull attached to a pelvis of dinosaur looks like? Would you like to know if one foot, equiped with a tortoise carapace, can survive the fight? Then lets face the challenge of the Lame necromancer. 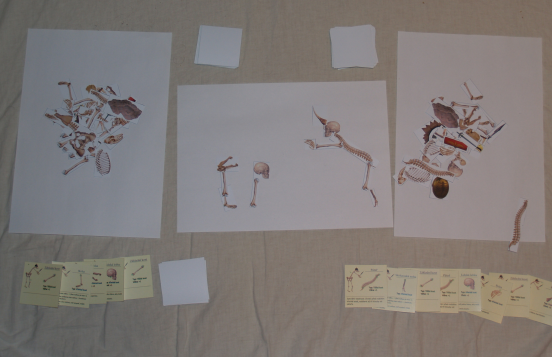 Print the files „skeleton-cards(1-4).png“ on a hard paper of format A4 and cut the cards with scissors. Print the files „skeleton-elements.png“ and „skeleton-elements-opposite.png“ on a hard paper of format A4 and cut the cards with scissors. If possible, print these files at both sides of one paper. The elements will be double-sided then. The author of the game will publish new cards and elements for you to download in the future.